*Unique approach to topics (world maps & cultures) that have been covered a zillion times before. *It made me want to research more! Enough tidbits that I really think everyone [kids and adults alike] could find something interesting. Food? History? Wildlife? Check, check, check! *Connects geography to culture so both become more understandable and meaningful. What a great bridge between picture books and non-fiction books! 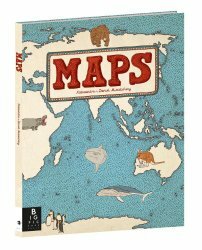 Here are maps that are illustrated in the same way a picture book would be, but provide factual information in a format (map) that students need to be exposed to! RI.3.7, RI.4.7: Use information gained from illustrations (e.g., maps, photographs) and the words in a text to demonstrate understanding of the text (e.g., where, when, why, and how key events occur). To hit these standards [RI.3.9, RI.4.9, RI.5.9: Integrate information from two texts on the same topic in order to write or speak about the subject knowledgeably], compare two (or three or four!) maps of the same location. *Why did one cartographer choose to include certain things and exclude others? *Could you create a map that integrates the most important aspects of the location for a tourist? For a hiker? I want to use this text as a jumping off point for a mini-research project. The pre-research activity is below. This part will kind of serve as the “K” (know) and the “W” (want to know) to a KWL. After my students fill out the questions and predictions based on “Maps,” I’ll provide more specific materials on the country they are interested in. For the pre-research activity, head on over to www.LessonBungalow.com! Ms. Davies makes the (sometimes daunting) world of microbes very manageable in this introduction suitable for any age group. Ms. Sutton’s illustrations make the invisible world of microbes come alive. The book covers the basics and offers some pretty great jumping off points for further learning! I Picked This Book Because…. Microbes are everywhere and we each have our own “fingerprint” of microbes. We trade microbes, we can alter our microbes through the foods we eat, and the microbes in one person’s body weigh as much as a brain. All in all, these little guys are really important to how we function. I’ve read & heard in a few places that our microbiome is like a city or ecosystem. It is so complex and densely populated, and it can hurt or help us depending on what it includes or excludes. Takeaway: Yes, some microbes can be bad, so wash your hands. But, they can also be really beneficial– we should learn how to properly take care of those little guys! Stop by Lesson Bungalow for an experiment & [free], ready-to-go PDF reading guide aligned to the book!